Shearing is an important maintenance activity that will reduce the chance of heat stroke, it keeps the wool from felting on the llama and it makes good use of the llama's fiber. Llama fiber is generally regarded as the 3rd best natural fiber in the world and fiber artists are starting to realize the high quality of our llama's wool. Llamas are, by origin, mountain animals who live in dry conditions. And, while it can get warm in the Andes, the humidity levels are rarely what we find in the upper midwest of the United States. It is that combination of heat AND humidity that can be a llama killer. Not to mention, the classic llama wool coverage of the South American llama is not a common wool type in the US anymore. North American domestication and selective focused breeding practices have developed the wide variety of wool types we see today and have created a greater need for annual shearing. Shearing is best accomplished in the spring (April, May) weather permitting. 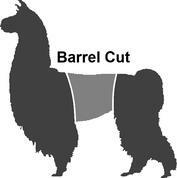 I know here in Iowa, we can occassionally have some very cold April weather that I would not want my llamas in fresh full cuts. Especially if you want to use your fiber for wool processing, once a year is plenty. Show llamas, on the other hand, may need mid-year touch ups for the show ring. 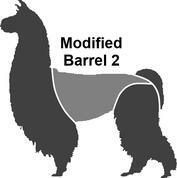 Their are 3 main cuts you can have on your llama. They are the barrel, lion and full "nudie" cut. Each cut is priced to the right of this page and will be described below. There are two main reasons to trim llama teeth. First, the males grow sets of fighting teeth which they can use to inflict wounds on other llamas, especially other males, when fighting for breeding rights and dominance. They will often try to use these to castrate another male. Torn ears are a common injury in a herd of males where fighting teeth are not cut. Secondly, if not given enough roughage to keep their teeth ground down, a llama's front teeth can get too long. If they get too long, they impact the upper palette too soon preventing the rear molars from being able to meet to do the grinding of the food. This can also lead to malocclusions of the jaw, either of which can lead to weight loss and possibly starvation of the animal from being unable to chew its food. Both male and female llamas develop fighting teeth. Each llama has a set of 6 fighting teeth. There are 4 on top and two on the bottom. The fighting teeth on a female are much smaller and go most unnoticed unless you have your hand in there. The males fighting teeth can grow to large canine proportions and can be quite formidable. These fighting teeth erupt around age 2 and should be first cut around the age of 3 in males. Females can usually keep theirs for their whole life. A male should be monitored and usually needs a retrim of the fighting teeth by age 7. Fighting teeth are easily cut off using OB wire, a dremmel or even a grinder if you are handy enough. Care should be used when restraining the animal to avoid cutting other parts of the llama's mouth if using the power tools. We use the OB wire as it is fast, easy and quiet, keeping the llama fairly calm. Llamas have 6 front teeth all on the lower jaw that contiually grow throughout their life. These are used to help grab and cut the vegetation they are feeding on. As noted above, letting these teeth get too long can lead to many issues, including a slow death of the llama from starvation. We use a Dremmel to grind the front teeth on our llamas down when necessary. Again, if llamas have enough roughage to naw on, they may never need to have these teeth trimmed. But if you see unexplained weight loss in an otherwise healthy llama, check those front teeth. Like humans, llama nails continually grow throughout their life. In the wild, llamas have enough rough surfaces to keep their nails worn down. In captivity, they often only have pastures and dirt floor barns with no way of keeping their nails worn down naturally. Overgrown nails will cause the llama to walk and move in ways they are not made to. The nails will often begin to curl under and force the llama to walk on the sides of its feet as the toes are twisted due to the nails being too long. Regular trimming of the nails should keep the nail from contacting the ground unless the llama is flexing its toes for extra grip. There is no cut and dry period of time to give to trim a llama's nails. Like humans, each has their own growth rates and activity levels that can dictate when they need trimmed. You best rule to follow is to get in the habit of watching your llamas feet when you are handling them. If you have concrete around which the llamas walk on frequently, listen for the clicking of their nails on the hard surface. At a minimum, take a good hard look at their feet every 3 months. We use a two person system. One person holds the llama's leg while the other uses pruning shears, the type with blades on BOTH sides, NOT the blade and hammer type, to carefully trim the tip and sides of the nail. Like any other animal, the llamas have blood in their nails "the quick" that will let you know if you have trimmed too far. Again, when finished, the llamas nails should not make contact with the floor if relaxed. Reaching and producing a slight dribble out of the quick is not bad, but you will definitely get your llama's attention. Unfortunately, we have had to add a "catching fee" to our services as we have had instances where we have spent considerable time and effort to chase, catch and halter llamas we need to work. So, if you hire us to come out and work on your llamas, please have them haltered and confined in a small area. If you do not own llama halters, at least have them confined to the small area. We always travel with a couple work halters to use if you don't have any. And, by "small area", we mean something no wider than 20 feet, so 2 to 3 of us can easily corner a hard to catch llama. If the llama(s) are adequately contained upon our arrival, no catching fee will be charged. As with any other service, time is money, and we may have other clients waiting for us.